Demons are only as powerful as you permit them to be. At times fire will fight fire yet at other times water quells fire much more successfully. Mastery over one’s inner demons is vital towards the quest for personal development. Let them rule and they will stay with you in this life and into the next incarnation. Some alleged demons are not in fact demons at all. Take the greatly maligned image of Baphomet for example. Baphomet represents just one horned deity twisted by the Church, with possibly a little mischievous help from Hammer Horror film productions, into an unwarranted aspect of unadulterated evil. 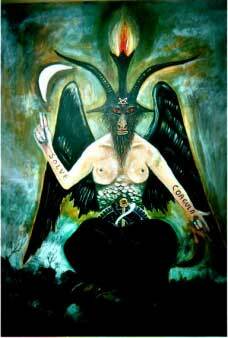 The hermaphroditic Baphomet is in fact a representative of the alliance of the spiritual and the physical, (as above so below) and the eternal universal‘oneness’ in all things to be discovered in the quest of enlightenment. When viewed from a shamanistic standpoint this image, like all horned deities, is no more an expression of evil than of good. The only aspects of evil exist in the fanatical minds of the self-satisfied bigots who promote fear and mistrust from the sanctity of their man-made churches. A powerful mind can achieve great things, whilst a weak one will always be at the mercy of others who smell fear, much like wild ravenous animals on the hunt for fresh meat. The meek may well inherit the earth, yet the meek in question will be the lowly insects that we crush indifferently underfoot. Chances are exceedingly high that human society will ultimately fall, not via any great war alone or due to asteroid hit, but from on uncontrollable outbreak of a new and ultra – lethal epidemic. Zombie movies; forget it! The horrific truth will be a million times worse! Given the correct conditions of an aftermath of social collapse and unsanitary conditions, possibly after war, the advanceof a new super virus could be excellent. Alternatively, mankind’s military ingenuity could create a similarly irrepressible scenario thanks to the imprudent utilisation of biological weapons. In places like Britain the situation could be made 100 times worse due to the most recent council-enforced insanity regarding public waste collections. The sensible Victorians brought in weekly waste collections to combat disease, yet the political fools who rule today changed this to fortnightly waste pickups. I covered this lunacy well in a previous book, Dirty Politics. Plague itself has ‘not’ gone away. It waits patiently for the right conditions, like a hungry crow sitting over an ancient battlefield.